There’s no contest that Street Fighter IV is an artistic wonder. No, I haven’t played it yet (I don’t own an Xbox 360 or a PS3..yet), but I sure hope I will in the near future. In the past Capcom has stated that that SFIV isn’t exclusive to the 360 or the PS3 and that versions for the PSP and DS could be possibilities. 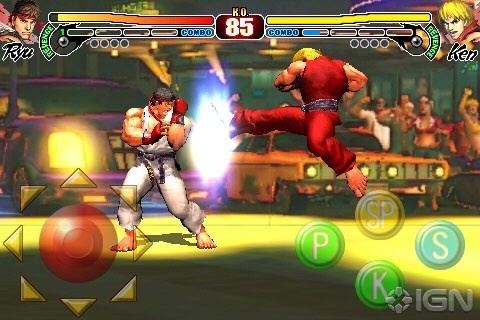 Neither handheld is getting SFIV because Capcom has announced it is coming to the iPhone in March. Confirmed characters are Ryu and Ken (add Chun-Li and Cammy and who else do you even need?). It looks like most of the visuals have been left in tact, and its just been scaled down, this means the 2.5-D fighter should still look gorgeous. The only thing that bothers me is the control. 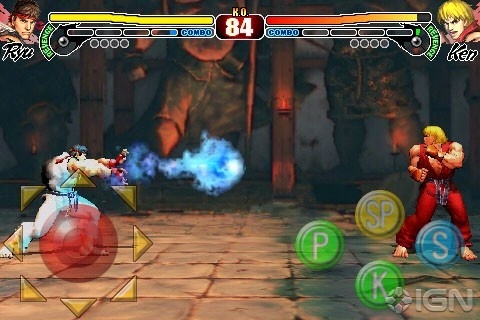 A D-pad and action buttons is super imposed over the visuals, blocking the lower half of the screen. Oh and it’s a FIGHTER. Without physical buttons, I’m not sure how well this fighter will be. I predict a lot of lost rounds because a kick or a punch didn’t register because of the damned touch screen buttons. If Capcom deems putting SFIV on the iPhone is more important than on the DS or PSP or Wii, then I think Sony Nintendo, especially the latter company have reason for concern as Apple’s iPhone and iPod touch continue to woo developers. No word on pricing yet, but I’d expect it to cost at least $9.99 if it’s a quality game. this looks pretty cool. i would like to see Guile in there… he was pretty good, and Akuma! !